Researching the history of a property can help someone learn about their heritage, stimulate the local economy, or perpetuate a community’s identity. But what types of sources are used to conduct property research? October is American Archives Month and the Arkansas State Archives’ theme for Archives Month is using archival records to research historic structures and properties. within a few short years, be destroyed by fire and replaced with the current Masonic Temple in downtown Little Rock. In a few months we will commemorate the 75th anniversary of the bombing of Pearl Harbor. As we get closer to that time, we recognize the loss of so many of our World War II veterans and we recognize the need to memorialize those brave men and women who served. Often it is difficult to find first-hand accounts of African American soldiers who were serving during World War II. We recently received the final report from a Curtis H. Sykes Memorial Grant recipient, Michelle Hamilton Rhodes, whose project, “A Soldier’s Heart: From the Philippines to Arkansas,” details the military career of Rhodes’ grandfather, Lewis J. Jackson. The letters document the life of Jackson, a teacher in Pine Bluff to Nanette White, his girlfriend and soon to be wife. As you know from our lead article, October is American Archives Month. Did you also know that another day recognizing the importance of records preservation is celebrated in October? Electronic Records Day is October 10 or “1010” —think bits and bytes. The commemoration, first held in 2010, is sponsored by the Council of State Archivists for the purpose of raising awareness about the importance of managing electronic files and digital data. George Sylvester McCue photographs and certificate, 1917-1918, 0.25 cu. ft.
Pulaski County Naturalization record book, 1882-1902, 1 cu. ft.
John J. Clendennin was born at Harrisburg, Pennsylvania, in 1813. He settled in Little Rock, Arkansas, in 1836, and became the private secretary to Governor James S. Conway. He was elected Circuit Court Judge in 1840, 1844, 1854, 1858, and 1874. Clendennin served as Arkansas Attorney General, 1849 to 1854. In 1866, he was elected Associate Justice of the Supreme Court, but his term was shortened due to the Reconstruction Acts. He died July 4, 1876. This collection contains a diary of daily activities and an account book of John Clendennin. Clendennin was the private secretary of Governor Conway and as such this diary includes information on Conway’s dealing and movements during his governorship. On Wednesday, Sept. 21, Gov. Asa Hutchinson issued a proclamation declaring October to be Arkansas Archives Month, in conjunction with the designation of October as American Archives Month. For the past several decades, American Archives Month has celebrated the importance of archives and the enduring value of American records and archives. As the Civil War drew to a close, physicians in Arkansas decided it was time to organize professionally, and in January, 1866, they formed the first such group, the Little Rock and Pulaski County Medical Society. It had thirteen inaugural members, and for the first six years of its operation was led by six different presidents. One of the early presidents was Philo O. Hooper, who went on to establish Little Rock's College of Physicians and Surgeons in July, 1873, after a dispute arose among members of the county society. On June 7, 1873, thirteen disgruntled members of the Little Rock and Pulaski County Medical Society officially withdrew from the organization in protest over its admittance of Almon Brooks, whom they felt fell short of the society's professional standards and ethics. They formed the College of Physicians and Surgeons, which continued for six years, resulting in two almost identical, yet competing medical associations in the Pulaski County region. In 1879, leaders of the two organizations were approached by the president of St. John's College, Leo Baier, who wanted his institution to include a medical department. Hooper, who still headed the College of Physicians and Surgeons, consented to the proposition, as did the competing organization's leaders, James A. Dibrell, Jr., and James H. Southall. The first joint meeting to discuss the venture was held on April 4, 1879. Unfortunately, St. John's College was already faltering, and more challenges arose in selecting a faculty, so this initial department never materialized. But the union between the previously competitive associations remained firm as they found a new home for their school: the Arkansas Industrial University, now known as the University of Arkansas in Fayetteville, Washington County. Incorporated in September 1879, this new medical department was an independent part of the university: Hooper selected the faculty, staff, and curriculum, and the university did not financially support the department. Instead, eight physicians invested $5,000 each, which was enough to buy the Sperindio Hotel at 113 West Second Street in Little Rock. These eight doctors became the University of Arkansas Medical Department's chairmen, and that autumn they accepted their inaugural twenty-two students. In 1911, fueled by a need to improve medical education standards in Arkansas, the university's medical department merged with a competing Little Rock medical school, the College of Physicians and Surgeons, which had been founded in 1906. (This college should not be confused with the original College of Physicians and Surgeons, which was simply an association of physicians.) With the merger came a fundamental change in the department's organization. The university began having a more direct role in educating budding physicians, while the department was able to begin receiving state appropriations. This collection consists of ledgers recording meetings called to order between 1872 and 1924 by the Little Rock and Pulaski County Medical Society, the College of Physicians and Surgeons, and the faculty of the University of Arkansas Medical Department. PH.RosemaryHamel.01: Left side Montine Cole, right side Pauline Cole. Sepia. Arkansas, circa 1920. PH.RosemaryHamel.02: Enoch Harvey Vance, father of Elizabeth 'Behie' Allison. Black and white. Arkansas, circa 1920. PH.RosemaryHamel.03: Elizabeth 'Bettie' Allison with unknown child. Black and white. Arkansas, circa 1900's. PH.RosemaryHamel.04: Dr. William M. Allison. Black and white. Arkansas, circa 1900's. PH.RosemaryHamel.05: Allison family reunion. From left to right top row: Marvin 'Mug' Cantrell, Will Allison, Sarah Ruth Allison, Buddy Allison, Ruth Allison, Arch Cole, Pearl Cole, Walter Allison, Hattie Allison Payne, Sarh Allison, Cecil Allison, Bob Allison, Peel Allison, Pauline Cole Ussery, George Ussery, Max Cole. Left to right bottom row: 'child' Allison, Elizabeth Allison, Gus Allison, 'child' Allison, Dr. William M. Allison, Montine Cole Lawrence, Lucille Allison, Gus Allsion , Corine Allison Cox. Black and white. Arkansas, circa 1925-1935. PH.RosemaryHamel.06: Arch Eugene Cole, Mary Pearl Cole, and Pauline Cole. Black and white. Quitman, Arkansas, circa 1910. PH.RosemaryHamel.07: Arch Eugene Cole. Black and white. Arkansas, circa 1910-1920. PH.RosemaryHamel.08: Pearl Cole holding Joe Paul Daves. Black and white. 1945. PH.RosemaryHamel.09: Montine Cole nine months old sitting in a highchair. Black and white post card. Conway, Arkansas, 1911 July 19. PH.RosemaryHamel.10: Mary Pearl Allison Cole portrait. Black and white. Circa 1920-1930. PH.RosemaryHamel.11: Mary Pearl Allison Cole portrait. Black and white. Circa 1930's. PH.RosemaryHamel.12: Cole family Reunion and William Allison 94th Birthday dinner. Black and white.Van Buren, Arkansas, 1936 December 23. PH.RosemaryHamel.13: Pauline Cole standing outside next to two unknown men. Black and white. Circa 1920's. PH.RosemaryHamel.14: Unknown group of people sitting on a sandy beach with two buildings in the back ground. Sepia. PH.RosemaryHamel.15: Two unknown men driving an four wheel buggy, pulled by a cow. A small unknown girl and a unknown man riding the cow pulling the buggy. Sepia. Circa 1920's -1930's. PH.RosemaryHamel.16: Elizabeth 'Bettie' Allison and Dr. William M. Allison. Sepia. Date unknown. PH.RosemaryHamel.17: William Pollard Jr., age 10 weeks. Speia. PH.RosemaryHamel.18: Joe Paul Daves, the son of Joe and Pauline Daves, reading a comic book. Black and white. PH.RosemaryHamel.19: Arch Cole, Pauline Cole, and Mary Pearl Cole sitting for a family portrait. Black and white. Circa 1900. PH.RosemaryHamel.20: Pauline Cole standing on a wicker chair. Sepia. Circa 1900-1910. PH.RosemaryHamel.21: Pauline Cole and Montine Cole . Black and white. Circa 1910's. PH.RosemaryHamel.22: Mary Pearl Allison Cole portrait. Black and white. Circa 1910's. PH.RosemaryHamel.23: Arch Eugene Cole portrait. Black and white. Circa 1910-1920. PH.RosemaryHamel.24: Mary Pearl Cole portrait. Black and white. Circa 1910-1920. PH.RosemaryHamel.25: Berry Riley Cole and Elizabeth Cole sitting outside. Sepia. PH.RosemaryHamel.26: Arch Eugene Cole standing next to Montine Cole. Black and white. Circa 1910-1920. PH.RosemaryHamel.27: Mary Pearl Allison is the second from the right. Mary is sitting next to two unknown men and an known woman. Black and white. Circa 1910. PH.RosemaryHamel.28: Enoch Harvey Vance portrait. Black and white. 1903 January 20. The Arkansas History Commission will hold a regular, quarterly meeting on Thursday, September 8, 2016, at 10:00 a.m. in the Arkansas State Archives conference room, located on the second floor of the Multi-agency Complex at One Capitol Mall, Little Rock, Arkansas. This meeting is open to the public. 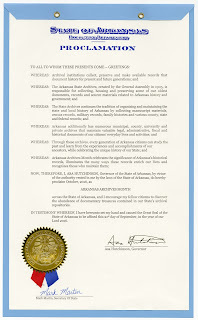 The Arkansas History Commission is an advisory body to the Arkansas State Archives. For questions and comments, please contact the Arkansas State Archives at 501-682-6900. Kelly Bryant was born in Shawnee, Oklahoma, in 1909. His parents later moved to Hope, Arkansas, where he was raised. He first ran successfully for the Secretary of State Office in the 1962 election. Bryant served as Arkansas Secretary of State from 1963 until he died in 1975. He served as President of the National Association of Secretaries of State in 1971. Bryant was in the middle of his seventh term and planning a re-election bid in 1976 at the time of his death. This collection contains correspondence, office memos, press releases, election material, state printing contracts, speeches, newsclippings, and publications and correspondence concerning the National Association of Secretaries of State. The Arkansas State Archives will be closed Monday, September 5 in observance of Labor Day.